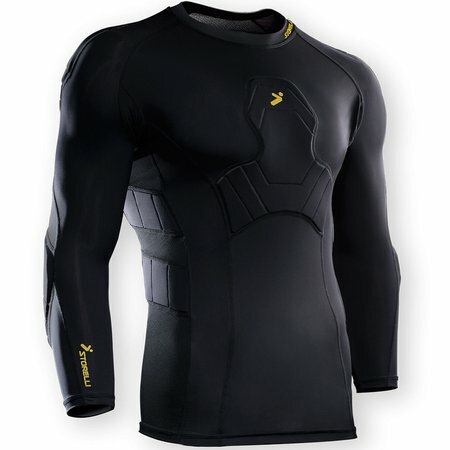 Make Your Mark with the Storelli BodyShield GoalKeeper 3-4 Shirt. Impact Resistant: Maximum impact and cut protection from high performance polyurethane foam padding on all the crucial areas of the upper body: shoulders, elbows and ribs. The chest pad shields against trapping hard shots while reducing rebounds. Sleek Design: Being a goalie, you are the last line of defense for the team. You need to lift up your teammates and demoralize your opponents. Wearing this black 3-4 Shirt GK shirt, you will have the confidence to stop any shot.